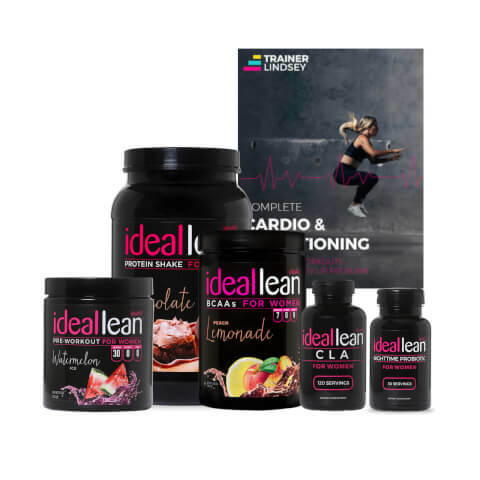 From delicious tasting, high-quality protein and pre-workout designed specifically for women, to effective supplements and Trainer Lindsey’s Cardio & Conditioning Ebook, this stack can help you get in tip top shape, so you can make this summer your best one yet. I absolutely love the Get Fit Stack. I'm a big girl trying to lose weight and so far everything I've tried has not helped, due to having PCOS. I started the Get Fit Stack 2 days ago and I absolutely LOVE it. The pre workout keeps me going all day, even after I exercise. I'm definitely going to keep getting this product. This stack as the cardio e-book (which I own) and it is amazing has so many ideas so you can switch up your cardio routine! the protein again is AMAZING pre-workout (I get stim-free passion fruit and it is delicious)!! !